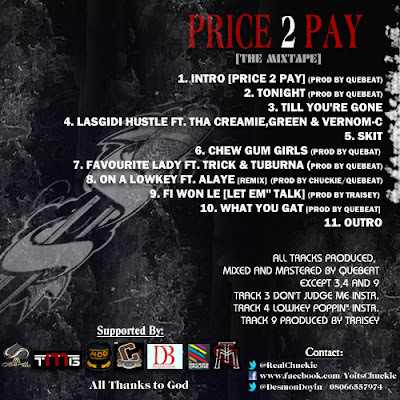 With a little over 168 hours to go before the release of the "Price 2 Pay" mix-tape from Chuckie, he releases another good tune for his fans' listening ear. This song, as produced by QueBeat and featuring Trick, alongside Tuburna is titled "Favourite Lady"; from the title, it's easy to tell this one's for the ladies. Chuckie has been drawing attention since the release of the remix to his "On A Lowkey" track, on which he featured Alaye and he seems to have put in quite a good effort in the compilation of his mix-tape as he endears his fans to anticipate it's release, come the 10th of March, 2013. He has also decided to share the official track-list for this project, as shown on the artwork below. Listen up and share your thoughts. | ENJOY!! !